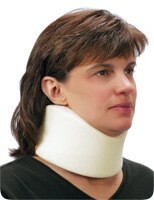 This soft, foam cervical collar is a non-rigid neck support. It is made from light density foam rubber and is covered with a 100% cotton stockinette. This collar, if properly positioned under the jaw, partially unloads the cervical spine by supporting a portion of the weight of the head. It also helps keep the neck warm and serves as a reminder to limit head and neck motion. This product should be used only under the supervision of a doctor. If you experience any sudden increase in pain or have any questions about the use of this collar, consult your doctor. 1. Close all hook-and-loop fasteners to prevent damage to other fabrics. 2. Remove the extra stockinette and wash separately.